[Update: Roku devices have now been updated with a new Enhanced Voice Search feature, so users can search for their favorite shows and movies by speaking directly into the Roku mobile app – or the remote, if you're using the Roku Streaming Stick+. Sometimes great products aren’t limited to the ones with the most features or the ones with the biggest and baddest processors. No, some of my favorite products work exactly as advertised and cost exactly what I would be willing to pay for them. It has its shortcomings – like an IR-blaster remote that needs line-of-sight in order to work and a Wi-Fi antenna that uses single-band 802.11b/g/n instead of dual-band 802.11ac – but at its core this is a no-frills streaming device that’s well worth its sticker price. 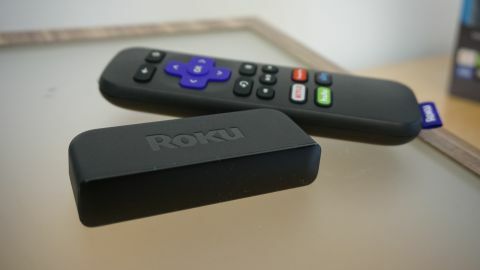 While the Roku Express’s performance might fit into the category of streaming video box, its stature puts it more in the category of a streaming stick. At 0.7 x 3.4 x 1.4 inches (H x W x D) it’s almost as small the Roku Streaming Stick and, funny enough, even smaller than the remote that comes with it inside the box. But, the benefit to its small form factor is that you can throw it in a bag or store in on your media shelf without it taking up too much real estate. The comparison to the Stick goes beyond size, however. Like the Roku Streaming Stick, the Roku Express is powered via its microUSB port. Roku ships the Express with a microUSB to USB cable, which can be plugged directly into your TV if your TV has a USB port on it, and a wall adapter if the first option doesn’t work. Roku also includes a two-foot-long HDMI cable in every box, a remote and double-sided adhesive tape that will allow you to stick the Express onto your TV or on any surface around it that still gives it line-of-sight to the remote. The inclusion of all these accessories is actually somewhat surprising – while other manufacturers are all too happy to send you out the door without all the necessary equipment in hand, the Roku Express is a complete kit. But there are two big problems here. The first is that its diminutive size would’ve made it easy to tuck behind a TV but, because it needs line-of-sight to the remote, it has to sit out on the shelf. It’s a minor problem, I’ll admit, but still one that irks me nonetheless. Moreover the one that really stuck with me was Roku’s choice to opt for an 802.11 b/g/n Wi-Fi antenna over a 802.11ac one. Because of that one design choice, it’s slower to load videos than its closest competitors and the range is significantly shorter, too. Performance, more or less, is shaped by three things: the Wi-Fi antenna, the processor and the Roku platform. We’ve talked about the Wi-Fi antenna already – most notably its short range and lackluster bandwidth – but we have yet to discuss the last two. Now, as we don’t know the name of the processor is inside the Roku Express, we’ll simply have to refer to it generically. The processor is, expectedly, middle-of-the-road. The Express starts up in under a minute and content generally takes 25 seconds or less to load on above-average wireless networks. If your network is a bit spotty or is prone to suffering from slowdown, however, expect that number to skew a bit higher. The counter-balance to the antenna and processor is the Roku platform – it’s lightweight and fairly minimalist in nature. At most there’s maybe 15 boxes on the screen, which makes it easy fodder for the Roku Express to scroll through without having to stop and wait for content to pop in. Combine these three factors and you have a useable streaming experience for less than the cost of a few Blu-rays. The Roku Express isn’t faster than Chromecast when it comes to streaming content, nor does it beat out Amazon’s Fire TV Stick or even Roku’s own Streaming Stick released earlier this year, but it does exactly what you’d expect it to do at a slow, but not horribly sluggish, pace. The other point worth pointing out is that the Roku Express can only handle streams of up to 1080p. If you want to stream your favorite Netflix or Amazon Prime series in Ultra HD, you’ll have to step up to the Roku Premiere line of set-top boxes or, if you want a streaming device in the smaller form factor, wait for the upcoming Chromecast Ultra, due out in November. So what, exactly, can you watch on Roku? Well, there’s the major streaming platforms – Netflix, Amazon, HBO, Hulu, Google Play TV and Movies – but then there are thousands of extra channels, many of which you’ve probably never heard of before. At last count, Roku has over 3,500 channels available to download with varying degrees of paid content, interesting shows and specificity. There's plenty of mainstream content – The Big Bang Theory is available on CBS All Access, Captain America: Civil War can be found on Google Play Movies and TV, etc... – but if you're looking for a film noir alien channel or an ultra-specific '90s country metal hybrid station, Roku's storefront is the place to find it. Cord cutters who live in the US will also have access to Sling TV and PlayStation Vue, the two new live TV cable alternatives that are bringing new life to the cord cutting movement. While both services run significantly better on higher-end streaming devices like the Roku 4 or the new Roku Ultra, they’ll still run on the Express’s lower-end hardware. But the biggest benefit of choosing a Roku Express over a Chromecast or Amazon Streaming Stick is the fact that it runs the full version of Roku’s OS. That means you’ll have access to every app the larger Roku boxes run as well as essential Roku functions like universal search that scours over 100 apps to find the best price on TV shows and movies and Roku Feed which surfaces content currently in theaters and alerts you when it becomes available on your favorite streaming services. Other platforms like Apple TV and Amazon Fire TV have implemented similar features on their boxes, but neither hold a candle to Roku when it comes to finding cheap content. The last piece of the puzzle worth talking about is the remote that ships with the Roku Express. The remote itself is matte black, incredibly lightweight and has a small purple Roku tag sticking out of one end. Depending on where you buy the Roku Express, the remote’s bottom four media buttons differ. However, what you’ll find exactly the same on every remote are the back, home, directional and playback buttons, all of which are pretty clearly labeled and dead-simple to use. The remote that was shipped to me had Netflix, Google Play Movies and TV, Hulu and Sling TV media buttons as well. What you won’t find on the remote is the 3.5mm headphone jack that you find on last year’s Roku 4 or this year’s Roku Premiere+ and Roku Ultra models that allows you to listen to your TV through the remote. That said, if you want that functionality and sit near your smartphone while binging your favorite shows, you can always download the Roku app which allows for private listening, faster search and the ability to control your Roku Feed. It’s a minor point, but the Roku Express is super simple to set up. Every cable you need comes inside the box, and the time it takes between opening the package and watching your next favorite show on Netflix is 10 minutes or less. Besides being one of the easiest to use products on the market, the Express is also the absolute cheapest at $30 (about £25, AU$40) and has done so without cutting many corners. It comes with a remote and a completely functional Roku platform, not some cheap watered down version. But while the Roku Express is the cheapest streamer on the market, it’s far from being the fastest or most powerful, even amongst its closest competitors. The decision to use an 802.11b/g/n 2.4GHz Wi-Fi antenna instead of one that uses dual-band 802.11ac is a costly mistake that adds noticeable buffering time at the beginning of streams. Also disappointing was the decision to include an infrared remote instead of Bluetooth, as the remote will always need line-of-sight to the Express in order to work. Overall, I’m impressed with the Roku Express. Despite its size, it rocks the complete version of the Roku platform without losing a single function along the way. Its small size and even smaller price tag make it one of the lowest points of entry into streaming, and a perfect gift for a family member or friend still on the fence about streaming video players. That being said, the Express is a somewhat paradoxical name – it’s not as fast as other streaming video players on the market or even as quick as Roku’s own streaming stick. For that reason, it’s probably worth looking at some other options like Chromecast, the Amazon Fire TV Stick or the Roku Streaming Stick for a faster, smoother experience, even if it’s going to cost a few dollars more.